If you have ever tried those hose menders (couplers) they sell at the hardware store only to get a leak, squirted in the face or have it fail after a single season, this is the hose mender for you. All metal, patented design and works like a charm. 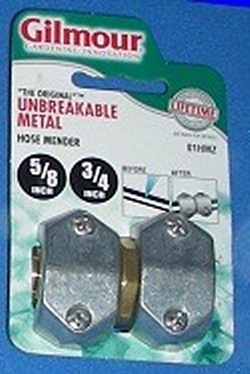 There are many different types of diy hose menders, but this is the only one that works, and works for life. (Yes, there is a lifetime warranty on this from Gilmour). Works with 5/8 and 3/4 hoses.